If you draw a straight line from Cambridge to Bury, it passes through Moulton, and so does the River Kennet. Now, the awful A14 thunders past some three miles north of here, but for centuries travellers came this way, crossing the river on the ancient packhorse bridge which sits in the middle of this lovely village. It may not be as pretty as nearby Dalham, but the open spaces and big houses tell you that it must be a fine place to live. The church is grandly set above the river, with a ford below, its bold west front facing dramatically across the valley. It is a breathtaking sight. It had been years since I had last been here. Back in 1999, I'd called here near the start of a bike ride from Newmarket to Ipswich. I'd got the key from the village shop, wandered up the hill and poked around a bit before moving on over the hill to Gazeley. As I recall, the village made more of an impression on me than the church did. Coming back in full sunshine, the imposing bulk of the building struck me, and the array of characterful grotesques and carvings in the frieze around the battlements. 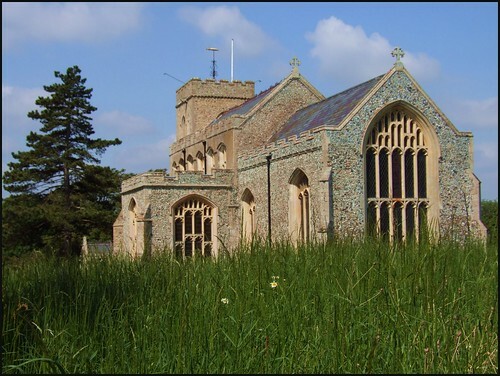 Apart from the 13th century tower, this church was rebuilt very late, in the early years of the 16th century, and is roughly contemporary with the more famous Lavenham. It is intensely Perpendicular, and shares a feature with that great church, as we will see inside. They probably intended to rebuild the tower as well, but the Reformation intervened. As I was wandering around, a woman came up and opened the church to do the flowers, and so I stepped inside and asked if it would be okay for me to take a look - I always ask, and in any case this church is still kept locked, a most unusual thing in this part of the world. She was very nice, and it was clear from what she said, and the way the church looked, that it is very much loved and cared for. The most striking thing about the interior is the lack of coloured glass, except for a single, and rather unusual, representation of the ascended Christ near the top of the east window. Given that this is a big church, and that the extensive restoration here was at the relatively early date for Suffolk of 1850, this imparts a rather spartan feel to the interior. However, there are a number of medieval survivals which are offset rather nicely by such a simple setting. The best of these are the four creatures on medieval bench ends set onto the modern choir stalls. They are probably contemporary with the rebuilding, and depict a unicorn, a stag,a sheep and a dog. Their hindquarters nestle the uprights of the bench end, and the stag in particular is unlike anything I have seen elsewhere in Suffolk, suggesting a stylisation which may have been a precursor of what would have been the English Renaissance, had puritanism not intervened. The loveliest feature of Moulton church is the frieze which runs above the arcades on both sides of the nave, an echo of the same thing at Lavenham. It is so crisp and immediate that for a moment you might be forgiven for thinking it a Victorian conceit. Proud angels stare piously down, and between them are little fleurons. This delicious floriation can also be found on the contemporary piscina in the chancel, and at its finest on the Priest door outside. This chancel was one of the last to be built in England before the Reformation put a stop to all that: here, in the early decades of the 16th century, the tall, windows with their tracery leading the eye upwards filled this space with a rational light which was so different to the mysterious qualities of its 14th century equivalent over the hill at Gazeley. This was architecture for the mind rather than the heart and soul: our ancestors, made serious by the Black Death and the events afterwards, were now living in a world of merchants as well as of peasants, of squires and landlords who touched their lives more than Kings, Dukes and Earls did. It is small wonder that they were fruitful ground for protestantism in its many shapes and forms.